← The Sports Archives – Cricket: No, Not the Insect…! What is F, C, & P? Why, fats, carbohydrates, and proteins, of course! The human body is an organic machine, and its fuel comes directly from one of these three sources. A solid understanding of how each of these substances interacts with the human body is necessary to leading a healthy, balanced lifestyle. In athletics, having the right kind of energy at the right times is vital to maintaining strength, endurance, and wellbeing. Examining how fat, carbs, and protein are broken down for use and how they each represent a unique form of nourishment in the body can help in deciding “which” and “when”. Most people attribute carbohydrates to grains and starches (including complex food products comprised of them, like bread). 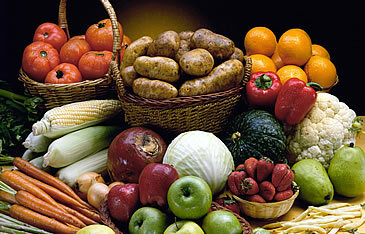 However, fruits and vegetables are often an even better source of carbohydrates, both simple AND complex. Of the three main forms of energy, carbohydrates are identified as that which burns in the body the fastest. When consumed, these molecules are converted into what is generalized as the term “sugars.” There are two main types of carbs: simple and complex. Simple carbs are small, basic molecules that can be absorbed very quickly, and complex carbs are larger “chains” made up of many of these simpler molecules. In the context of dietary impact and athletics, carbohydrates immediately provide the energy the body needs for strenuous physical activity, but if they are not absorbed shortly after being consumed, the body will store them as fat instead. As a result, people prone to long periods of inactivity are encouraged to “watch their carb intake” because they are not using what they are eating! Athletes, on the other hand, can benefit from high amounts of carbs before exerting themselves, which is where this form of energy comes in handy! 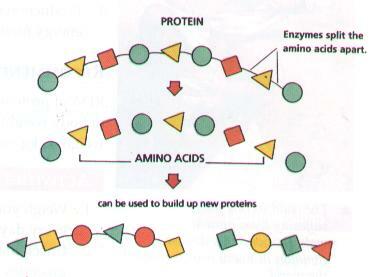 A simplified graphic that demonstrates the relationship between amino acids and proteins. Proteins are molecules comprised of substances called amino acids. Amino acids are a vital component of bodily function, and while some can be “artificially” synthesized, many of the amino acids that humans need to survive cannot. Thus, protein must be acquired from food. Proteins are more complex than any type of carbohydrate, and as a result, are slower to be assimilated into energy. The role of proteins as a component of the human body is not as direct as carbs or fats. Amino acids are required to repair and fortify most human cell tissue. This is why athletes who are working to gain muscle mass are encouraged to consume more protein than other people. However, if a person is not getting enough energy from food or stored fat, proteins are the next to be burned for energy. Protein’s flexibility and restorative qualities make it a “friend” to athletes everywhere. Protein most often comes from meat and animal sources, carbs from starches and plants, and fats from nuts and healthy oils. However, there are food items that break these patterns! Do not hesitate to seek them out! The final major form of energy for the human body comes in the form of fat. In modern society, any source of fat is stigmatized because of the adverse physical effects it can have in excess quantities. It is important to understand, however, that some fat is necessary for survival! Fat molecules are the most complex of the three energy types, and they are also used for several other bodily processes, including growth and hormone synthesis. They are also more efficient than proteins and carbs when the energy that they produce is weighed against quantity consumed. Unfortunately, the body stores excess nutrients as fat molecules because it is such an effective fuel source. Burning fat with exercise is a chore for the same reason. Understanding the different forms of energy the body utilizes as nutrients is critical to leading a healthy, balanced lifestyle. Sadly, even in the world’s wealthiest countries, food options that contribute to physical fitness and wellbeing are sometimes difficult to find, let alone keep. However, a knowledge of what to look for in a meal is always beneficial, and it paves the way to an optimum, controlled living standard, and, in the case of an athlete, an ideal consumption plan that accomplishes fitness goals and maximizes performance! This entry was posted in Fitness/Wellness, Other and tagged carbohydrates, eating and nutrition, fat, health and wellness, healthy-living, nutrition, nutrition and diet, protein, sport, sports, sports and fitness, sports and training, Sports Archives, Sports Blogs, sports performance. Bookmark the permalink.